Welcome back to my last day of Growing in Unity! Awww, can you believe my week is over? How sad! I hope you all have been enjoying my 1 stamp 2 ways series! I really loved doing it! Ok, so I totally neglected to use something I LOVE about Unity, the Kit of the Month! I used Jan '10 Savor the Journey for these two cards. Again, two ways. I made one feminine card and then a more masculine card. For my first card, I used the new Unity KOM sketch. This is a really fun sketch! I need to use it again! For this card, I used Bo Bunny Vicki B. Isn't this paper so pretty? I used Nesties beaded circles behind the cute little bird. The ribbon is a really sweet pink crinkly ribbon and at the bottom, I used a border punch. 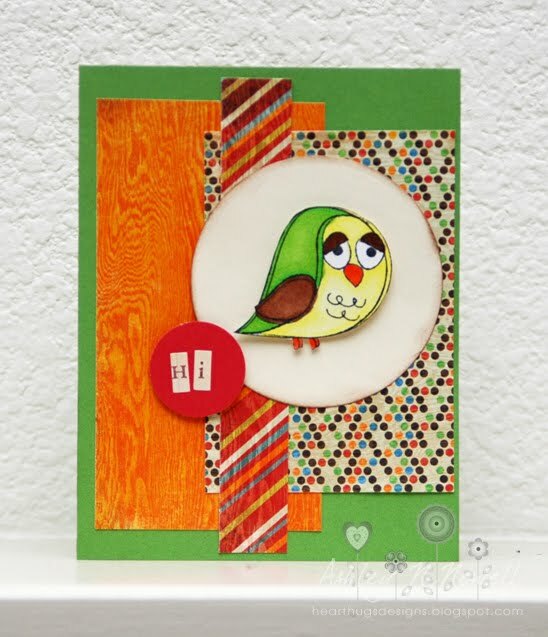 For my second card, I decided to use Jen del Muro's Sketch for You to Try for May. I am also entering both these cards in Unity's Monthly challenge which is to use birds. I really wanted to make a BRIGHT card so I broke open my new Basic Grey Life of the Party paper. I busted out my Copics to color this little guy. Fun, right? And I spelled out my sentiment with stickers. Your little bird is just darling! I love the paper piecing and coloring. Both ways look great! You had a fabulous week of GUI Ashley! Very cute! Love that little bird!!! I just love both these cards. Great paper piecing and just love the layouts and colors. Thanks so much for an inspiring week with Unity! You rocked GIU this week. SUPPPPPPPER cute! I love that masculine card--love the coloring on the owl. AND I love love love that female version--that paper pieced owl is SUPER adorable! LOVE that bold ribbon color too! MUST get me some of that:) YOU ROCKED GIU!!!! Super cute! Love that bird and getting the KOM!!! Your cards are so totally FAB. I love the way you stamp onto your DP. I really am gonna do this. I have lots of stamps and lots of DP!!!
. It's all I've said in my last few posts to you but I am gonna try it!!!!!!! Tfs!!! Have a terrific weekend! Happy Mother's Day! Thanks for an inspiring week!!!! OH, these are so cute! I am loving this owl stamp! So cute! I love all the patterned paper you used. The first card is my fav but they are both fab.!!!!!! Lovely cards. Thanks for leaving your sweet comment on my blog. I got to know about Unity recently and would love to play their challenges but dont have any Unity stamp yet...lol. may be some day. Two more great cards! Very nice paper combinations! It's been fun seeing your GIU posts and projects each day! Thanks for sharing with us! Super cuteness Miss Ashley!!!! tfs!!! These are so cute! Love the paper piecing of the bird is the first, darling! Wow what great cards... I love the birds... they are sooo very sweet. Great blog... I will keep an eye on your blog... truly wonderful!! Great job on these cards, I love how the 2nd one turned out! That's such a funny little bird, but you certainly showed off how versatile s/he is! Great paper piecing, Ashley. Both cards are adorable. your projects this week have been amazing..love them all ..Hope you have a good Mothers Day!! I have a mixed emotion kinda day..its my birthday and mothers day, I lost my mom last year, but am pregnant this year, so a little happy a little sad..
that's one sweet owl! love him both ways. love those owls! Thanks for playing in the TWEET challenge!